Hey, February is National Bird-Feeding Month! 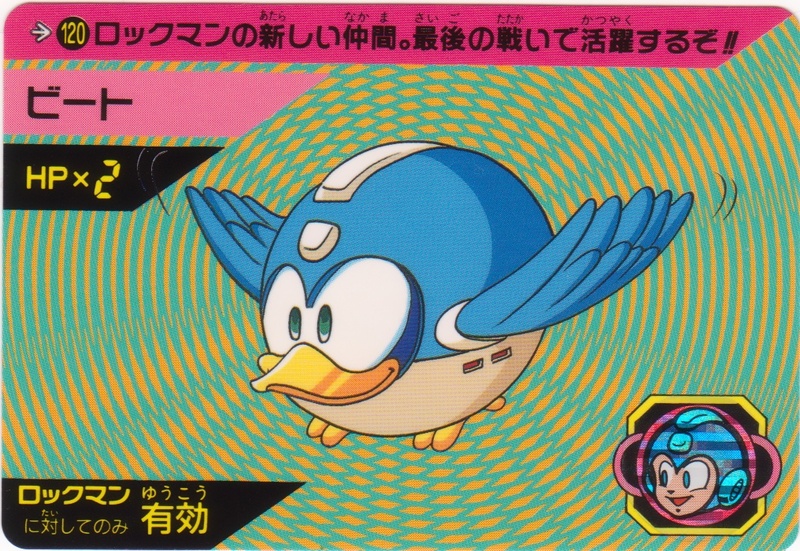 I’m taking advantage by spotlighting Rockman’s winged sidekick. 120. Rockman’s new ally. Turns the tide in the final battle!! 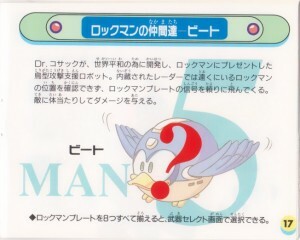 Beat’s first appearance was in 1992’s Rockman 5. Dr. Right’s newly befriended genius scientist Dr. Cossack pushed robo-ornithology to new heights in this compact model, initially designed to aid in combat, but eventually Beat would handle everything from scouting to deliveries to last-minute saves from bottomless pits, and even vehicle transformations. This bird-type combat support robot was developed by Dr. Cossack for the sake of protecting world peace, and presented to Rockman. His internal radar can’t lock on to Rockman from a distance, so he needs to rely on the signal of the Rockman Plates to be able to fly to his aid. He is able to deal damage to enemies with his body crash attacks. *Collect all 8 Rockman Plates, then you can select this from the weapon select screen. As you may recall, Rockman’s support robots use a special Rockman location system so that they can instantly arrive by Rockman’s side in his time of need, without wasting their energy and risking themselves by following Rockman around the entire time. Dr. Cossack needed Dr. Right’s help to utilize that technology, but that plan went awry when Dr. Right was kidnapped before the project was completed. That’s why the in-game Rockman Plates and later, BEAT Plates or Beat Whistles were necessary to provide the lock-on signal Beat requires. Couldn’t they just adjust Beat’s radar? Probably best not to think about this solid Nintendo logic too hard. Beat was truly a powerhouse in Rockman 5. As his Carddas card suggests, Beat takes out bosses including the final boss of that game with relative ease. Sorry, Wily… You just got Beat. In Rockman 6 Beat could no longer damage bosses, which reduced his usefulness to helping to get past certain stage obstacles a little easier. 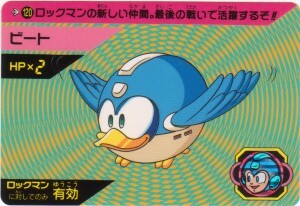 Still, this bird made such an impression the first time that Dr. Wily tried mimicking his design with the Rockman 6 stage enemy called Peat. 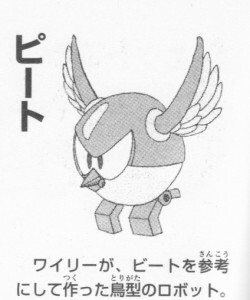 A bird-type robot Wily made by referencing Beat. This mass-produced menace for could be troublesome for Rockman, but was no match for the real deal. Still, Rockman 6 basically marked the end of Beat’s combat days, except for one glorious resurgence in the auto-scrolling shooter stages of Rockman 8. His shtick became more rescue-related from Rockman 7-on, pulling Rockman’s 230-pound frame out of falling deathtraps (something Rockman’s flying dog apparently never thought to try). 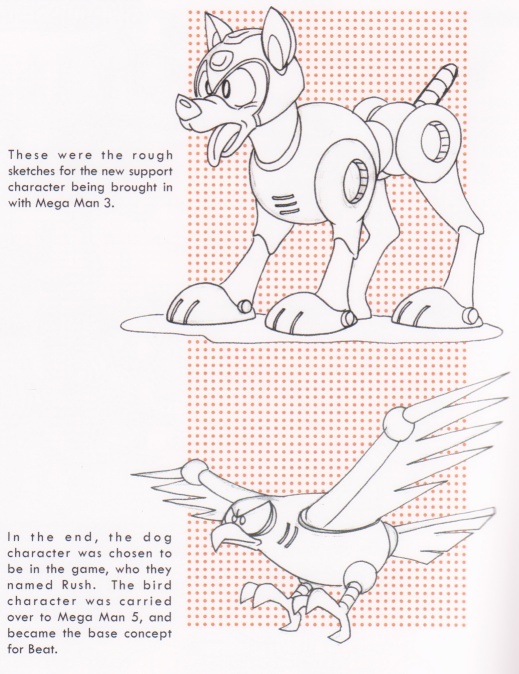 The book made another interesting revelation on page 120, proving the idea for a bird-type support robot for Rockman went all the way back to Rockman 3! 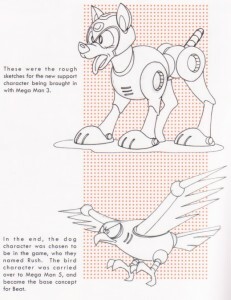 It’s hard for me to imagine how different the series might be if Rush had been a robotic falcon rather than a dog! Sure the dog flies anyway, but might the bird version have carried Rock in his talons (as beat does) rather than having him ride on his back? And would the bird have still transformed the way Rush does? Instead of springboards and submarines, might they have designed completely different ways for the support character to enhance gameplay? Just think: Rockman 3 could have been a completely different game! In general, I think the idea of a boy and his dog is more universally identifiable for kids, whereas having a pet falcon seems much more reserved for super-heroes. And we wouldn’t have the current Beat we know and love, that much seems certain. As much fun as it is to imagine the way things might have been, in the end I’m glad how things eventually turned out. Go out and enjoy your last day of National Bird-Feeding Month! Why not pick up a bird feeder, or go toss stale bread to some ducks at the local pond, they always appreciate it. Be sure to tell ’em that Beat sent ya. 4 Comments to "Beat It!" You know which game I’d really have liked to have Beat at my side, much like in Mega Man 5 or 6? Mega Man 9. There are so many annoying enemies, from the flying shooting crystals to the Head Grabbers of Doom, against which Beat’s automatic targetting would have been a godsend. We were having an unseasonable warm spell in my area, so it would have been a perfect time for bird feeding this last weekend. Although yesterday it started to rain, which I’m sure the birds didn’t mind. Beat’s attack powers would have rocked in 9, agreed. Actually, I still found his gimmick useful for intentionally jumping in pits and bypassing certain areas with ease. Maybe someday Beat will be able to do both functions in the same game, making him about as versatile as Rush (in 9 and 10, anyway). Wow didn’t know there was a month for that but I really shouldn’t be surprised. That would have been different if Rush was a falcon instead of a dog. Peace on Earth? 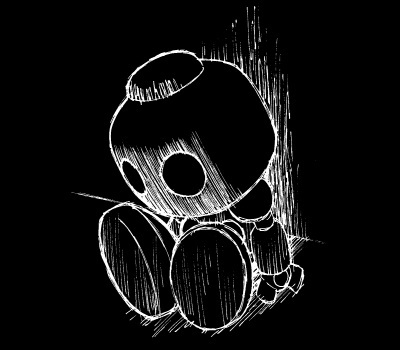 Ill Will Between Robots!